On Saturday, February 25th, #AASL executive director Sylvia Norton presented an #ESSA workshop for members of the Teacher Librarian Division (TLD) of the Arizona Library Association (AzLA). AASL offers a strong collection of Every Student Succeeds Act (ESSA) resources for all concerned school librarian/library advocates. At the meeting, TLD was able to report that Arizona’s ESSA Plan, which was submitted for federal approval in January, mentions school librarians twice. School libraries are not mentioned at all in the plan. See below. As noted in my January 30th post “Advocacy and Collaboration Support ESSA,” AzLA’s Legislative Committee and Leadership helped support TLD’s advocacy effort. In Arizona, our challenge going forward is how to encourage school districts to include school librarians and libraries in their ESSA plans and grant proposals. As clearly demonstrated in the recent National Education Association’s (NEA) report “Library/Media Centers in U.S. Public Schools: Growth, Staffing, and Resources: Full Report” school librarianship is in desperate straits in Arizona. These are just a few alarming Arizona data points from the NEA study report. “Those states reporting the fewest percentages of schools with library/media centers are Arizona, Massachusetts, and Alaska, (79.6%, 77.3% and 74.5%, respectively)” (19). “States reporting the fewest [school librarians] are California and Arizona (54.5% and 64.1%, respectively)” (40). For at least a decade, educators in Arizona have only been required to pass a test in order to become state-certified school librarians. According to the NEA report, 24.5% of practicing Arizona school librarians have earned M.L.S. degrees compared with 51.85% at the national level. And I suspect that many M.L.S. school librarians are on the verge of retiring. (An M.L.S. was required in Arizona when I started my graduate program in 1990.) In districts across this state, there are minimal salary incentives, if any, to earn a Master’s degree. With so few professional school librarians in practice, no incentives to be fully prepared for the role, and no school librarianship course work offered at a reasonable tuition in the state, it is difficult to image how Arizona school librarian/library advocates can capitalize on the ESSA opportunity. Still, for some Arizona school districts that fund (at least) half-time librarians in every school, support may be within reach via grant funds for school librarian professional development or finessing the reinstatement of full-time positions (!). Then the question will be from where will these professionals come and how will they be prepared to serve? The view from the Grand Canyon state may be bleak but thankfully, there are bright spots on the national level that offer encouragement for the future of our profession. In Pennsylvania and Nevada, there are efforts to require full-time, state-certified school librarians in every public school. If you have an ESSA update to share, please do so by adding a comment to this post. •School librarians to share professional learning for colleagues and disseminating the benefits of new techniques, strategies and technologies” (41). B. The State’s strategies and how it will support LEAs to provide equitable access to a well-rounded education and rigorous coursework in subjects in which female students, minority students, English learners, children with disabilities, or low-income students are underrepresented. Such subjects could include English, reading/language arts, writing, science, technology, engineering, mathematics, foreign languages, civics and government, economics, arts, history, geography, computer science, music, career and technical education, health, or physical education. LEA curriculum and instruction, as required by Arizona Revised Statutes §15-701, will be aligned to challenging academic standards. Through alignment to Arizona standards, all Arizona students will be provided equal access to a challenging, well-rounded instructional experience. Struggling learners will be addressed through intervention strategies while advanced learners receive acceleration and enrichment based on individual student needs. Gifted learners will receive appropriate gifted education services and support in accordance with Arizona Revised Statutes § 15-779, 15-779.01 and 15-779.02. In addition, school librarians support rigorous personalized learning experiences supported by technology and ensure equitable access to resources for all students” (50). Arizona Department of Education. “ESSA State Plan Final Draft – Federal Submission,” Azed.gov, https://cms.azed.gov/home/GetDocumentFile?id=58780e64aadebe183c5d5dc9. Accessed 27 Feb. 2017. Tuck, Kathy, D. and Dwight R. Holmes. “Library/Media Centers in U.S. Public Schools: Growth, Staffing, and Resources: Full Report, 2016,” NEA.org, http://www.nea.org/assets/docs/Trends%20in%20School%20Library%20Media%20Centers%20Full%20Report.pdf. Accessed 27 Feb. 2017. Image credit: Pennywise. 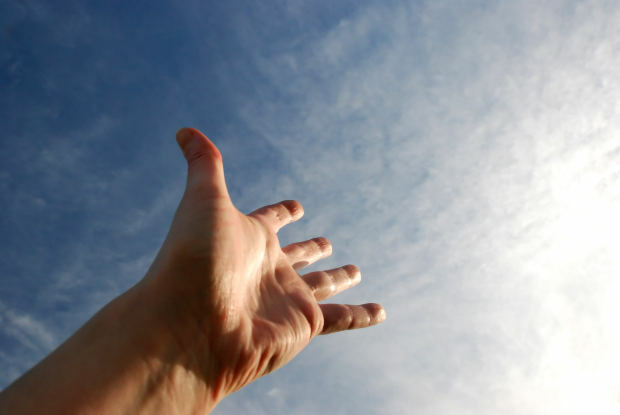 “HandReach,” Morguefile.com, http://www.morguefile.com/archive/display/156694. Accessed 27 Feb. 2017. Digital Learning Day 2017 (#DLDay) will be held this Thursday, February 23rd. 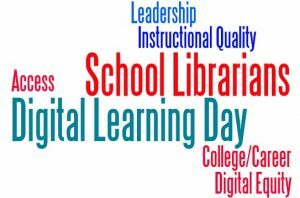 School librarians from across the U.S. will be participating and showcasing the digital learning that’s happening in their schools. This annual event was mentioned in last week’s “Future Ready Librarians: What’s Not to Love?” Webinar. On Digital Learning Day (DLD), the Alliance for Excellent Education is sponsoring a free Webinar: Digital Learning Day 2017: “The Value of a Connected Classroom.” You can sign up on their site. School librarians especially appreciate the consistent focus on digital equity. School libraries are one place on school campuses where all students should be able to gain access to the digital tools and resources they need to be successful. Several data points in National Education Association’s just-released “Library/Media Centers in U.S. Public Schools: Growth, Staffing, and Resources: Full Report” suggest that our nation’s schools have not yet achieved equity. I include Arizona’s data because I was a long-time Arizona school librarian and school librarian educator; I currently live in this state. 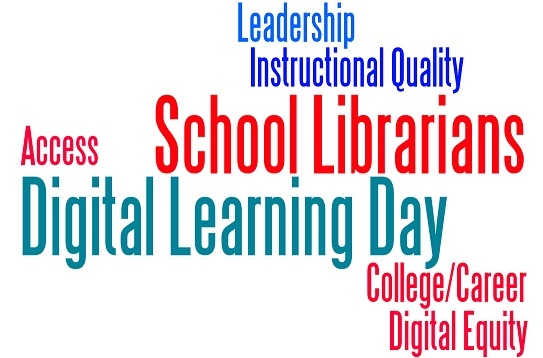 Digital Learning Day offers a snapshot of every day of the school year. This year, I will be looking for the ways Future Ready Librarians are forming instructional partnerships that ensure that students are effective users of ideas and information and proficient in knowledge creation as they appropriate digital tools and devices to meet their learning and presentation needs – all year long. Gordon, Carol. “Teacher-Librarians as Champions of Digital Equity.” SLAV, vol. 14, no. 1, 2016, www.slav.vic.edu.au/synergy/volume-14-number-1-2016/research-into-practice/607-teacher-librarians-as-champions-of-digital-equity.html. Accessed 17 Feb. 2017. Tuck, Kathy, D. and Dwight R. Holmes. “Library/Media Centers in U.S. Public Schools: Growth, Staffing, and Resources: Full Report,” 2016, NEA.org, http://www.nea.org/assets/docs/Trends%20in%20School%20Library%20Media%20Centers%20Full%20Report.pdf. Accessed 17 Feb. 2017. If advocating for literacy for all is “political,” then a growing number of school librarians, authors, publishers, and schools are speaking up and out about the empathy and attitudes that will help ALL students become the respectful, successful native-born or naturalized citizens our country needs. With this post, I applaud and join with them. The following exemplary examples are just some of this work that came across my computer screen last week. I hope school librarians will follow these links and be on the lookout for other ways we can align our work with inclusion and take action for social justice. School librarian Elissa Malespina penned and illustrated “An Open Letter to School Librarians,” which was published on the School Library Journal (SLJ) Web site. 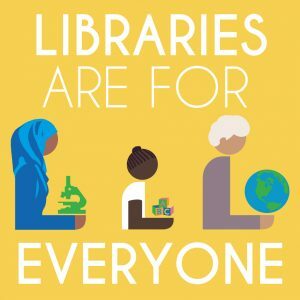 In her opinion piece, she challenges school librarians to take a firm stand about how we welcome and include students in our libraries and schools. “Every day students of different races, nationalities, and sexual orientations walk through our doors. Our libraries must be safe spaces for them, since the outside world has become increasingly unsafe.” For Ms. Malespina (and I hope for you), silence is not an option. The 2017 TLT Project is Social Justice YA Literature. Use this link to read more about this timely and essential effort. To participate in this effort on Twitter, use the #SJYALit. Tomorrow, Tuesday, February 14th, Booklist, Second Story Press, and Lee & Low Publishers, are offering a free one-hour Webinar titled “Teaching Tolerance.” On the promotion for this event, the collaborators cite increased bullying in schools as an indication that educators and parents are called upon to use children’s literature to help young people increase their understanding and acceptance of “others.” School librarians can support classroom teachers and families by spotlighting these titles and integrating them into their collections and teaching. BACC blog readers can find another resource for books about refugee and immigrant experiences on the Bridging Refugee Youth and Children’s Services Web site. This annotated list includes forty titles for both children and teens. This post would not be complete without a huge shout out to Luma Mufleh and an appeal for your support for the Fugees Family. Coach Luma began her humanitarian work in 2006 by offering refugee boys a free, organized soccer team. Today, the Fugees Academy is the only school dedicated to refugee education in the U.S. One hundred thirty-six boys and girls are members of the Fugees Family and participate in year-round soccer, after-school tutoring, an academic enrichment summer camp, or are full-time students at the Fugees Academy where they learn academics and build character and leadership. Like all 501(c)(3) organizations, the Fugees Family stays afloat through grants and on-going fundraising efforts. Please consider supporting their current effort – a t-shirt that reads: “Refugees – USA – Welcome.” Support these young people and their teachers. Purchase a shirt and wear it proudly. Thank you all for the work you do and for speaking up and out. 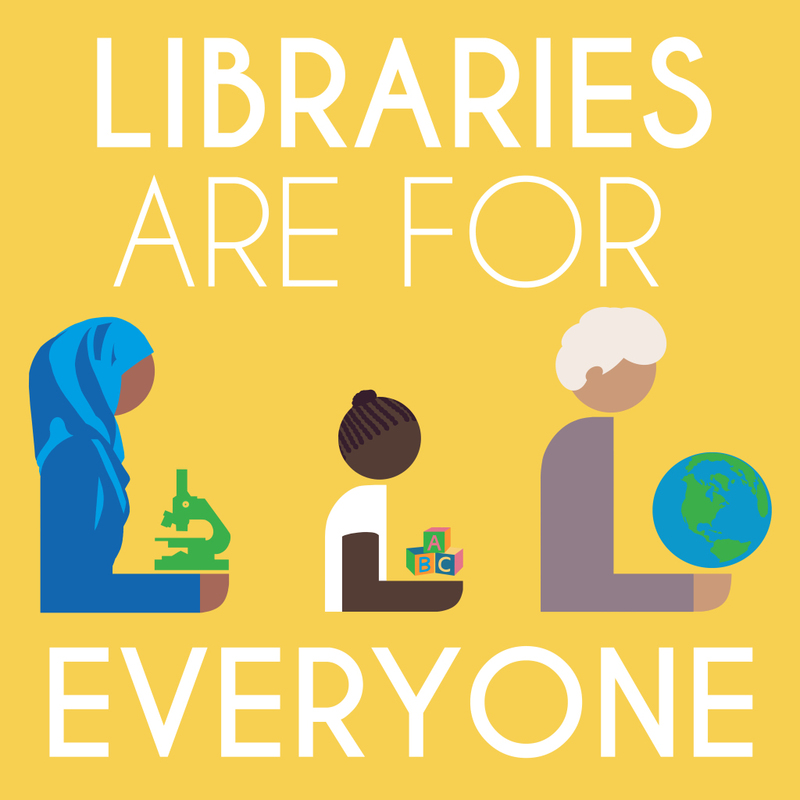 And I close with one additional special thank you to Nebraska assistant public library director Rebecca Corkindale who collaborated with librarians from Saline County Library in Benton, Arkansas to create “Libraries Are for Everyone” graphics. With the help of librarians from around the world, Ms. Corkindale continues to translate the text on these copyright-free graphics into many languages. I have been a member of the International Literacy (formerly Reading) Association (ILA) since the late ‘90s. As a school librarian and school librarian educator now consultant, I believe it is important for school librarians to “reach across the aisle” to read the publications our classroom teacher colleagues and administrators are reading. This helps us engage in conversations about this information while we stay abreast with issues in the larger education arena. 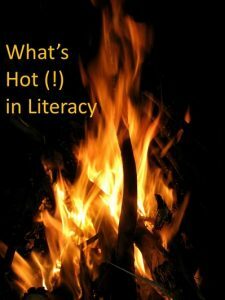 For the past twenty years, ILA has been conducting an annual survey and publishing the “What’s Hot in Literacy Report.” The goal of the survey is to rank literacy-related topics in terms of what’s hot (talked about) and what (should be) important at both the community and country levels. You can access the 2017 “What’s Hot in Literacy Report” and read a summary of the report posted 1/11/17 by April Hall on the ILA blog. This year 1,600 respondents from 89 countries responded to the survey. There are many take-aways from this year’s survey that should be of particular interest to school librarians. These are just some of the highlights. It is no surprise that assessment and standards are the #1 hot topics, but survey respondents feel these topics are not as important as the attention they are getting. They rank #10 at the country level and #12 at the community level. While there is no doubt in my mind that school librarians must gather student learning outcomes data that reflects the effectiveness of our teaching/coteaching, we want to continue to measure the impact of our school library programs in other terms as well. 1. Are students, faculty, administrators, and parents involved in planning, managing, and promoting the school library program, including literacy events and teaching activities? 2. Do visitors to our library make positive remarks regarding the activities, displays, and learning engagements taking place? 3. How many successful inquiry learning units have we coplanned and cotaught this month/semester/year, and how do students and colleagues talk about these experiences? 4. How often does our principal make remarks in faculty, PTA, and school board meetings and other communications related to the work of the school librarian and the role of the school library program? Another area that I think should be of interest to school librarians is early literacy. In the survey, it is both hot and important. 80% of respondents at the community level and 78% of the respondents at the country level feel early literacy is very or extremely important. While some elementary school librarians serve the needs of preschool children in their community, I believe it behooves us to develop more partnerships with families, childcare centers, and non-profit agencies in order to support early childhood education and family literacy. When I served as the school librarian at Corbett Elementary School, I provided a monthly storytime for Head Start children, teachers, and families. At Gale Elementary, our library program offered a weekly storytime for a developmental preschool that met on our school site. Still, I thought our libraries could do more. For example, in my role as a literacy coach at Van Buskirk Elementary, I collaborated with the community outreach coordinator to facilitate a weekly workshop for parents, most of whom were primary Spanish-speaking moms. They made books, personalized with characters and information related to their family culture, which they practiced reading in the workshop and could read fluently at home to their children. The “What’s Hot in Literacy Survey” also found that parent engagement is more important than it is hot. Let’s keep thinking about how we can support family literacy in our communities. Teacher professional learning and development were other areas that 71% of respondents believe are very or extremely important. From my perspective, homegrown, personalized learning for educators should be extremely hot and extremely important. For me, classroom-library coteaching was the most effective way to develop my own practice and influence the professional learning of others. I will post the link in the comments section when it goes live.